The New York Daily News laid off half its staff. Now what? Former New York Daily News staffers affected by the sweeping round of layoffs at the Tronc-owned tabloid are still coming to grips with the aftermath of the decision. Chelsia Rose Marcius, who had been at the paper for almost six years, was photographed leaving the building's headquarters in tears on Monday. But she wasn't crying for herself, she said. "It was about seeing this dismantling of my family and people I love and care for," she told CNN's Brian Stelter on Wednesday. "The paper's the people -- it's the people who work there, and what they want to do, and how they want to serve the community. It's not just the name. And seeing that slaughter is just, I mean, it gets to me. 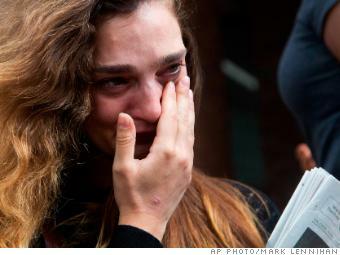 I woke up crying this morning because it's still, it's going to be hard for a while." 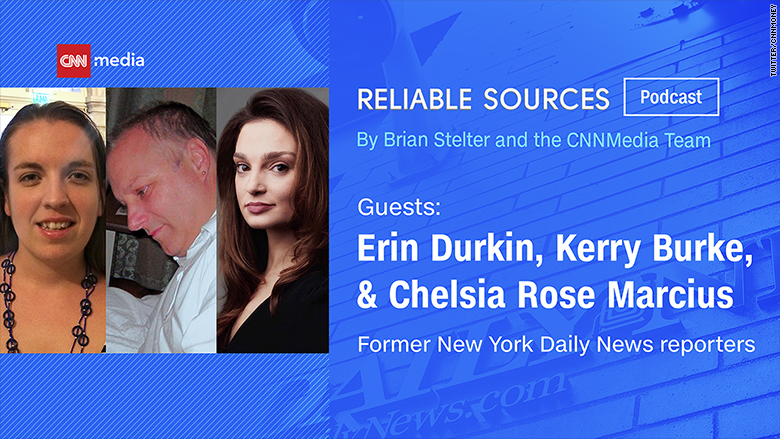 Marcius joined Daily News reporters Erin Durkin and Kerry Burke, who also lost their jobs on Monday, on this week's Reliable Sources podcast to discuss Tronc's handling of the layoffs, the paper's place within New York, and the reporters' next moves. Burke, who had been at the paper for more than 16 years, said there was no sense of why particular roles were eliminated. "I've talked to people who were in the meeting, and I talked to editorial staff, and Tronc, there was no input from anyone who actually worked at the Daily News as to who would stay and who would go," Burke said. "It was someone in Chicago looking at a spreadsheet." Tronc, in an email to employees, obtained by CNN, said it was reducing the size of its editorial team by about 50% "and refocusing much of our talent on breaking news -- especially in areas of crime, civil justice, and public responsibility." The call for breaking news is "very ironic," Marcius said. "Kerry and I run around this entire city and all we do, or a big chunk of what we do, is breaking news," Marcius said. "Erin is on the forefront of political breaking news. What and how are they going to do that?" Covering breaking news in New York City can't be done by monitoring Twitter from the comfort of a computer or phone screen, she said. "It's not a matter of looking at what other people are just putting out there on the ether, on social media," Marcius said. "It's about being there and talking to people on the ground." Durkin said The Daily News "is always the paper of average New Yorkers, the working class, the people in the outer boroughs, people who just needed to know what was going on in their city." Over the years, the publication has broken stories about marijuana arrests and a now-nixed tax break for Donald Trump, among others. It was the first to publish a full video of Eric Garner being put in a chokehold by a New York police officer in 2014. Garner, who repeatedly declared that he couldn't breathe, was declared dead at a nearby hospital. Both Marcius and Kerry were on the front lines of the Garner story; Marcius interviewed witnesses, while Kerry met with the family in their home. Garner died in Staten Island, but his last words, "I can't breathe," turned into a national rally cry in protest of use of force by police against minorities. The reporters said that they'd sensed the paper getting smaller over the years, even before Monday's cuts. The paper used to have reporters in Washington who covered Congress, and reporters dedicated to each of the city's five boroughs, Durkin said. The consequences were apparent during this primary season, when Alexandria Ocasio Cortez clinched the Democratic nomination in New York's 14th district -- and the paper no longer had the political resources it once did to properly cover the story. Burke said he had to rush to the Bronx to cover her victory. "You get the feeling you're holding it together with your bare hands," he said. "All local journalism has turned into parachute journalism." The layoffs at the 99-year-old paper have amped up concern for the state of local journalism, especially in an era when digital is edging out print. Tronc, which owns a smattering of local publications such as the Baltimore Sun and the Hartford Current, recently sold the Los Angeles Times to billionaire Patrick Soon-Shiong. And, cuts at its other papers aren't over, CNN reported Monday. "All these conglomerates that don't have any role locally are bleeding the brands dry, to use their term," Burke said. "They're not investing. They talk investment but they're not investing. What they're doing is they're cutting. They're cutting and they're selling off the parts."